Global demand for wipes is forecast to increase 5.2 percent annually through 2018 to $13.5 billion. Because wipes are considered convenience products rather than necessities, developed nations represent a disproportionate share of sales. However, developing markets will account for a rising share of wipes sales going forward. 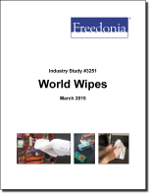 This study analyzes the $10.5 billion world wipes industry. It presents historical demand data (2003, 2008 and 2013) and forecasts (2018 and 2023) by product (e.g., personal care wipes, household wipes, healthcare wipes, manufacturing wipes, commercial wipes), world region, and for 14 countries. The study also considers market environment factors, details industry structure, evaluates company market share, and profiles 26 industry players, including Kimberly-Clark, Procter & Gamble, and Nice-Pak Products.